This tutorial will build a sample module that implements the Popup Control Extender from the Microsoft ASP.NET AJAX Control toolkit. 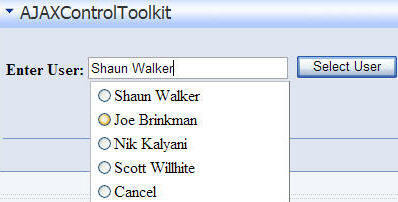 The extender will be used to display a list of names in a drop-down when the user clicks on the text box. The user will be able to type a name in the text box or select a name from the drop-down list. The .zip file that you download will contain a number of files. 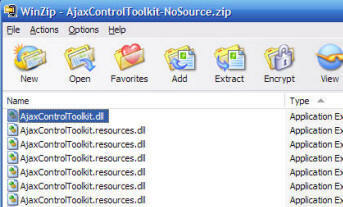 Unzip the file AjaxControlToolkit.dll and place it in the "/bin" directory of your DotNetNuke web site. 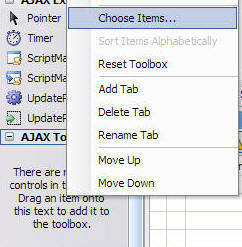 In Visual Studio (or Visual Web Developer Express), right-click on the toolbox and select Add Tab. 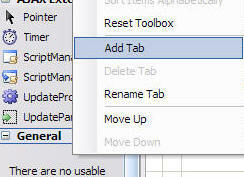 Expand the tab that was just created and right-click on the section and select Choose Items. Use the Browse button to browse to AjaxControlToolkit.dll (in the /bin folder of your DotNetNuke installation) and click the OK button. Create a DotNetNuke User Control (See the tutorial Creating a Super-Simple DotNetNuke module for information on how to create a DotNetNuke User Control). <%@ Control Language="VB" AutoEventWireup="false" CodeFile="AJAXControlToolkit.ascx.vb"
Save the User Control and place an instance of it on a page in your DotNetNuke site (see the tutorial Creating a Super-Simple DotNetNuke module for information on how to configure a DotNetNuke User Control and place an instance of it on a page in your DotNetNuke Site). 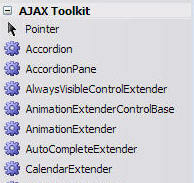 You can download the complete module from here: AJAXControlToolkit_01.00.00_Install.zip. 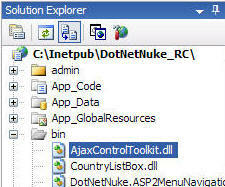 to instruct the DotNetNuke framework to insert the ScriptManager control that allows the AJAX functionality to work. 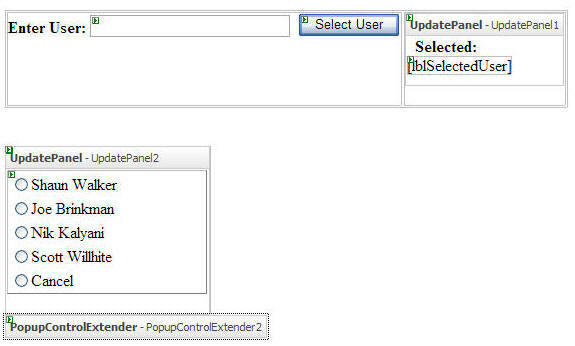 Update Panels are only used to wrap the drop-down list and the Selected label. The sample code has this dependency set, AjaxControlToolkit.PopupControlExtender. If the ASP.NET AJAX Control toolkit assembly is not in the /bin folder of the DotNetNuke site (or available in the Global Assembly Cache (GAC)) the module will not install and it will show an error.